The 7th Annual Washington Gardener Magazine Photo Contest kicks off now! Time to start sorting and picking out your best 2012 garden shots. The entry period is January 1-21, 2013. UPDATE: The entry period has been extended to Tuesday, January 22. Due to the holiday and inauguration on January 21. Note that eligible entries must have been taken in the 2012 calendar year in a garden setting within 150-mile radius of Washington, DC. For our December 2012 Washington Gardener Reader Contest, Washington Gardener Magazine is giving away one of our brand new Local Gardening Task Calendar. 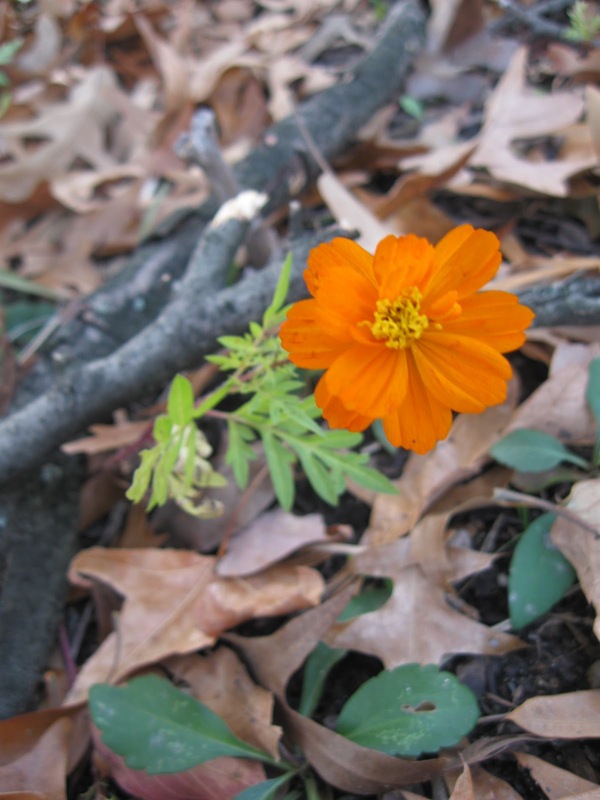 Each month includes a list of what to do in the garden for local DC-MD-VA and Mid-Atlantic gardeners, along with a gorgeous photo of a seasonal flower from a local DC-area public gardens’ collection. To enter to win a Local Gardening Task Calendar, send an email to WashingtonGardener@rcn.com by 5:00pm on December 29 with “Garden Calendar” in the subject line and tell us: what gardening chores you most dread doing and why. In the body of the email, please also include your full name and mailing address. The pass winners will be announced and notified on January 1. From the Smithsonian Institutions' Archives of American Gardens, Garden Club of America Collections. 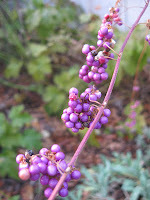 The Washington Gardener Enews ~ December 2012 issue is now sent to all current Washington Gardener Magazine subscribers. 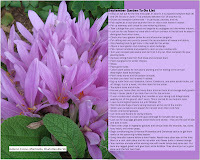 It is also posted and archived online at: http://issuu.com/washingtongardener/docs/wgenews-dec12. You can access it as well as all of the other Washington Gardener Enews back issues online now and anytime in the future at http://issuu.com/washingtongardener/docs/. 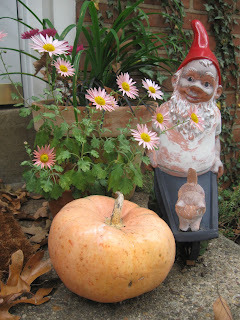 It is still technically fall, but tell that to my garden! I think this is the earliest I've ever had my Winter Jasmine bloom and at the same time having its early spring doppelganger, Forsythia, also sporting a few blossoms! Also in bloom now are Christmas Hellebores, Violas, Encore Azaleas, Alyssum, and Primrose. Still holding on from summer are a few salvia and verbena too. What is blooming in your garden on this Garden Bloggers' Bloom Day? This 2010 video features Monty Holmes, a horticulturalist at Smithsonian Gardens. He gives an inside look at the history, culture and science of poinsettias, thousands of which have a happy home for the holidays all throughout the Smithsonian in Washington, DC. Behind-the-scenes making of Winterthur Museum's Dried Flower Tree. The dried daffodils are especially amazing, IMHO. 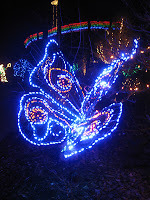 For our November 2012 Washington Gardener Magazine Reader Contest, Washington Gardener our prize was passes to the Brookside Gardens’ Garden of Lights display. The show runs from Friday, November 23, 2012 through Sunday, January 6, 2013 (with the exception of December 24-25 and January 1-3). The hours are 5:30 to 9:00pm, with the last car admitted at 8:30pm. Entry is by car/van and is $20 on Mon-Thurs and $25 on Fri-Sun. They responded with “none yet” to long lists of select bulbs. Tulips, Daffodils, Crocus, Dutch Iris, and Alliums topped the list. 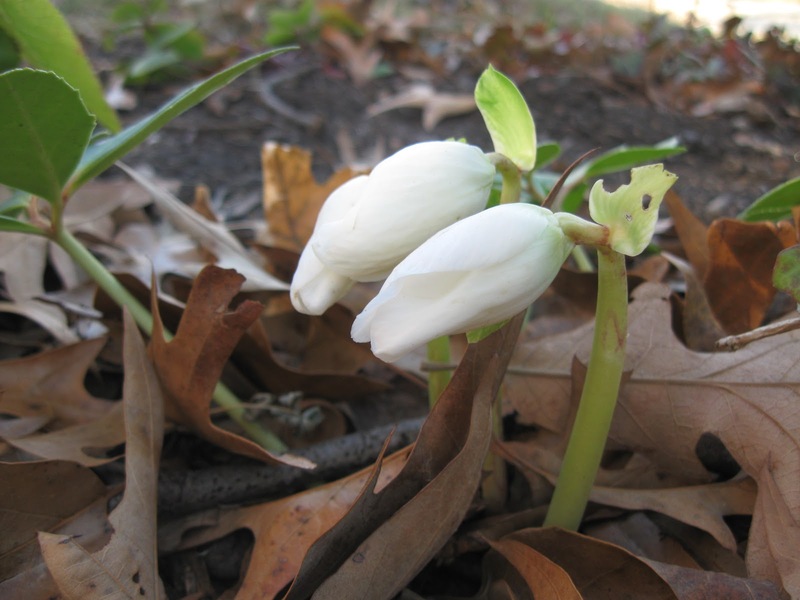 Minor bulbs such as Chionodoxa (Glory of the Snow), Camassia, and Muscari (Grape Hyacinths) were mentioned by a few. Some vegetable gardeners mentioned Garlic as well. Not very popular were regular Hyacinth, which got hardly a mention in our unscientific poll. What bulb are you planting for blooms next spring? PS It is NOT too late for Mid-Atlantic gardeners to get your spring-blooming bulbs in the ground! Try to get them in by mid-December, but you really have until the ground freezes. Poinsettias: You Can Grow That! The 4th of every month is "Garden Bloggers: You Can Grow That" Day. 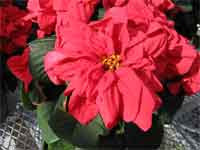 Being the holiday season, I decided I'd dispell some myths about growing Poinsettias and show you how easy they can be. 1. How do you choose the freshest poinsettia? 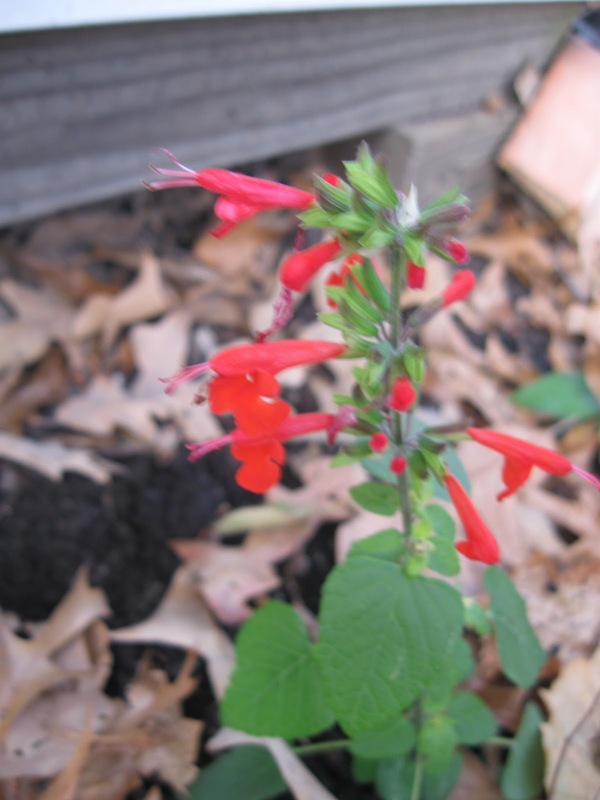 The first thing is to take the plant out of the sleeve, then look at the very center of the red bracts or leaves. You are looking for a cluster of very small green “buds” with a small amount of yellow, this is really the flower. This is a direct indication of the age of the plant. The tighter the buds with small amounts of yellow can mean a longer shelf life at home. 2. How do you make your poinsettia last through the holiday season? Place them in an area that gets bright but direct sun unless the window is facing east. This area must also be free of drafts or direct heat sources. When it becomes time to water, remove the plants “pants” (the foil or decorative pot cover). Place the plant in the sink and give it a good amount of water. For a 6” plant two cups of water should work or 5-7 seconds with a sink faucet sprayer. After the plant has stopped leaking water, place the plant back into its foil pot cover or decorative pot. 3. What are the newest trends in poinsettias? One of the most common things florists and garden centers are doing is the application of paints to the bracts to come up with different color combinations. Another trend is the many growers who are hybridizing poinsettias to get different-shaped leaves. Others are making new poinsettias with different shades of the same color on the same bract. You Can Grow That! 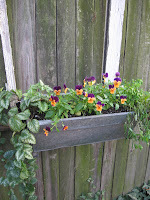 is a campaign created by garden writer and master gardener C. L. Fornari. 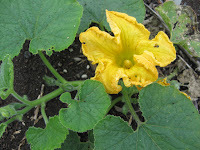 On the fourth of each month participating garden bloggers will write about something you can grow. Stop by the You Can Grow That! Facebook page to read all of the posts. Gifts for Local DC-MD-VA Gardeners! If you were away over the Thanksgiving weekend or just got busy and missed our last few posts, here is a round-up of great gifts for the local gardeners in your life. All about Washington DC, Maryland, and Virginia gardening! Washington Gardener NEW Wall Calendar! ~ Local DC-MD-VA Gardening Calendar from Washington Gardener Magazine. Includes monthly task lists for local DC-MD-VA gardening and photos of gorgeous flowers from Washington, DC-area public gardens. PS Be sure to specify on the initial order page what month you wish to start the calendar with as you can customize it for any 12-month-span you like. ~ Gift yourself or the local DC/MD/VA gardener in your life with a set of ALL 30+ Washington Gardener Magazine back issues for just $100. This price includes postage and handling! Your order must be prepaid by check or money order. Order by December 17 to guarantee delivery by Christmas! ~ In the spirit of Thanksgiving, I'm running this subscription special through December 5 in gratitude for all my online friends, followers, fans, and frequent commenters. 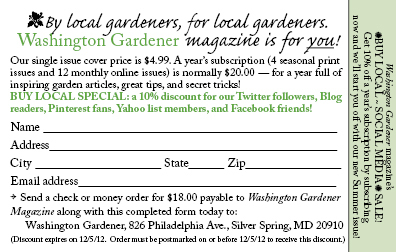 Fill it out and mail it in with your check/money order to get 10% off a year's subscription to Washington Gardener Magazine. Please tell all your local gardening friends! Smithsonian Gardens shows how they actively manage their tree collection. One of the large American elm trees at the National Museum of Natural History was being affected by disease and decay issues that were leading to its rapid decline. Using a cutting edge technology, tree RADAR testing, the tests helped to determine the extent of the problems and to evaluate the safety of the tree. 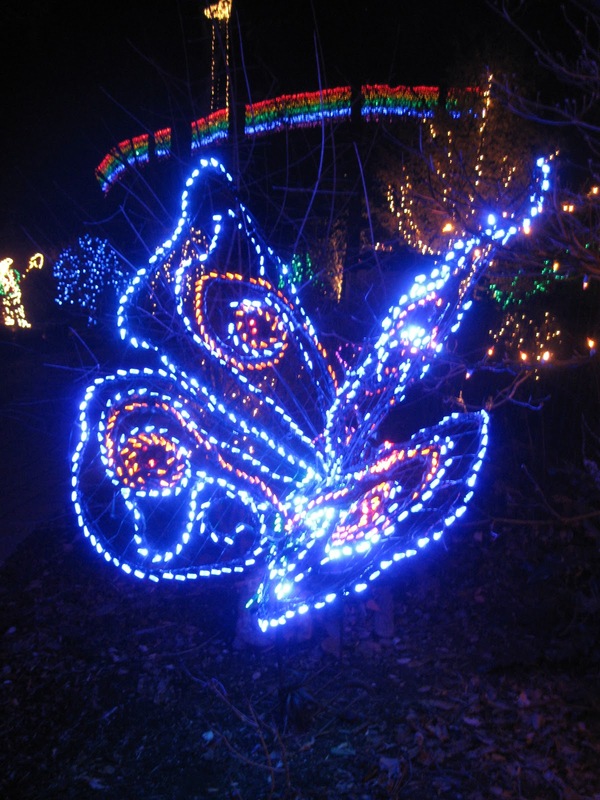 For our November 2012 Washington Gardener Magazine Reader Contest, Washington Gardener is giving away passes to the Brookside Gardens’ Garden of Lights display. 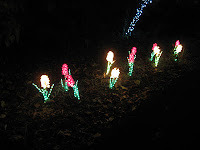 To enter to win a vehicle pass to Brookside’s Garden of Lights Show, send an email to WashingtonGardener@rcn.com by 5:00pm on November 30 with “Brookside Lights” in the subject line and tell us: what spring-blooming bulbs you planted this fall. In the body of the email, please also include your full name and mailing address. The pass winners will be announced and notified on December 1. Local DC-MD-VA Gardening Calendar from Washington Gardener Magazine. Great gift for yourself and any area gardeners you may know! Gift yourself (or the local DC/MD/VA gardener in your life) with a set of ALL 30+ Washington Gardener Magazine back issues for just $100. This price includes postage and handling! Social Media Sale for Small Business Saturday! I'm also running a Washington Gardener Magazine Back Issue Sale, full details can be found in on the latest Washington Gardener Enewsletter posted here (see page 8) and also in our next blog post at http://washingtongardener.blogspot.com/. 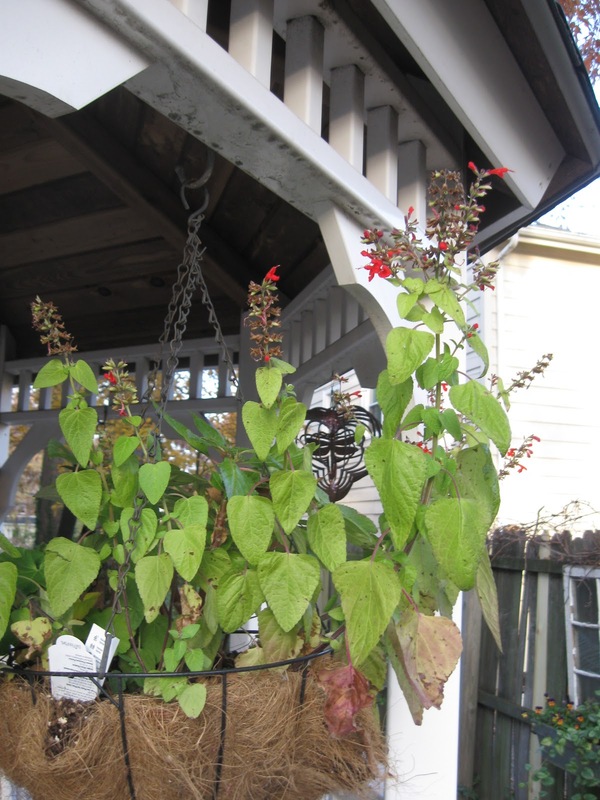 Washington Gardener Enews ~ November 2012 issue. You can access it and all of the other Washington Gardener Enews back issues online now and anytime in the future. I'm loving this purple alyssum is 'Blushing Princess' from Proven Winners. It kind of sat around this summer in the record heat, but really has come to life this autumn. 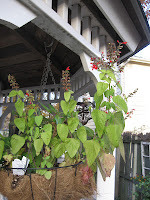 I have it trailing over the edge of a few different pots and hanging baskets. I sprinkled a packet of mixed cosmos seeds in the hellstrip out front in very late summer. Totally forgot about them until I saw a few blooms had actually emerged through the leaf litter. This is the longest the beautyberries have ever stayed on for me. I'm thinking it has something to do with the bumper crop of small acorns I have. The birds are finally letting me enjoy these berries after the foliage drops off the shrub. A red salvia is still hanging on and blooming in my gazebo baskets. Not only that it re-seeded below the baskets this summer and those off-spring are already blooming as well (see photo below). Talk about bang for your buck! “My favorite tool in the garden, if I must pick one, is my long handled garden claw. It chops hard dirt, it cultivates and mixes the soil; it makes small furrows and it weeds quite handily. My claw must be over 60 years old,” said John P. Haslinger of Silver Spring, MD. We selected two winners at random. They are: Dean Mosher of Annandale, VA and Sarah Urdaneta of Berwyn Heights, MD. Congratulations! 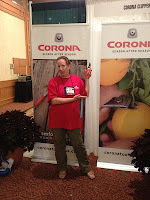 Each receives a red Coronoa Tools t-shirts (size XL) and garden clippers from Corona Tools. An authentic American brand, Corona tools were born in the orange groves of California in the 1920s. Since then, generations of agriculturists, gardeners, landscapers, arborists, and construction professionals have turned to Corona to find high-quality tools that work as hard as they do. They know that Corona’s iconic red handles are an immediate symbol of quality and long-lasting durability. Learn more about CoronaTools at http://coronatoolsusa.com/. In this video, Kathy Jentz, Editor/Publisher of Washington Gardener Magazine, demonstrates how to save seeds before winter. I hope you are saving and carefully labeling your seeds for our upcoming Washington Gardener Magazine Seed Exchanges this coming January/February! Chrysanthemums: You Can Grow That! I’ll confess I had a longtime aversion to chrysanthemums. Both their smell and commonness turned me off. But recently I had a change of heart. I discovered a whole new world of mum growing that goes far beyond those boring mums sold in bunches at your local supermarkets. Chrysanthemums are an asset to any perennial garden. They provide quiet foliage all through the growing season and then set bloom right when most everything else is finished. From gold to pink to white and maroon, there is a color for every planting scheme. Don’t limit yourself to just the pompon cushion variety either. A personal favorite of mine mum is the Sheffield Pink, which looks like a peach-colored daisy on tall stems. It is terrific for cutting and is especially nice planted next to Autumn Joy sedum. 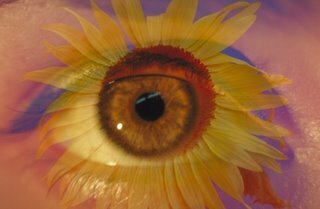 The flower is significant in many world cultures. The name “Chrysanthemum” is derived from the Greek, chrysos (gold) and anthos (flower). Chrysanthemums were first cultivated in China as a flowering herb as far back as the 15th century BC. In many countries, it is associated with funerals and grief. 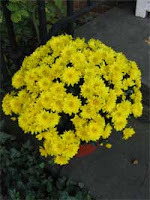 In the United States, mums are generally seen as a cheerful bloom. 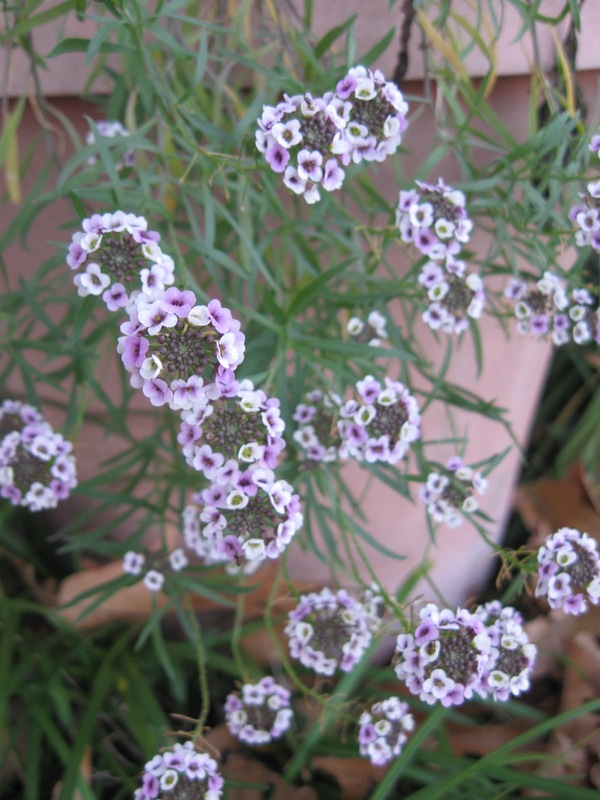 The flowers have medicinal, culinary, and insecticidal properties – aside from their ornamental attributes. According to Gary Mangum, president of Bell Nursery, who supplies plants to Home Depot throughout the Mid-Atlantic, “Yellow is the most popular mum color for us.” Bell Nursery has taken the love of mums to the next level by breeding giant mums that are upwards of three feet across! “We find that people get instant gratification by covering a lot of area and getting a lot of color with fewer plants,” said Mangum. “We have seen a huge growth in the popularity of the giant mums each year they are in the stores.” Home Depot expects to sell 30,000 of the giant mums in the region this year, doubling last year’s sales, as well as selling 500,000 of Bell Nursery’s regular sized mums. Mums are ideal container plants and can then be planted after blooming. Be sure you select plants that are cold hardy and healthy. Plant in full sun and give them space. They need good air circulation. Every three years divide the plants in spring. They need good drainage and a light mulching in spring helps. 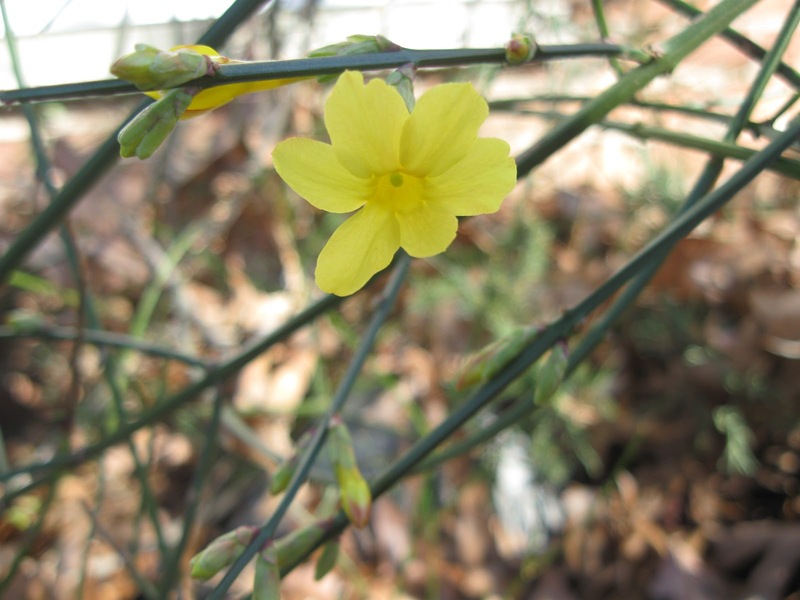 Pinch them back before July to create compact, bushy plants with more blooms. Provide extra mulch in fall for winter protection and do not cut them back until early spring when some new basal growth begins to emerge. 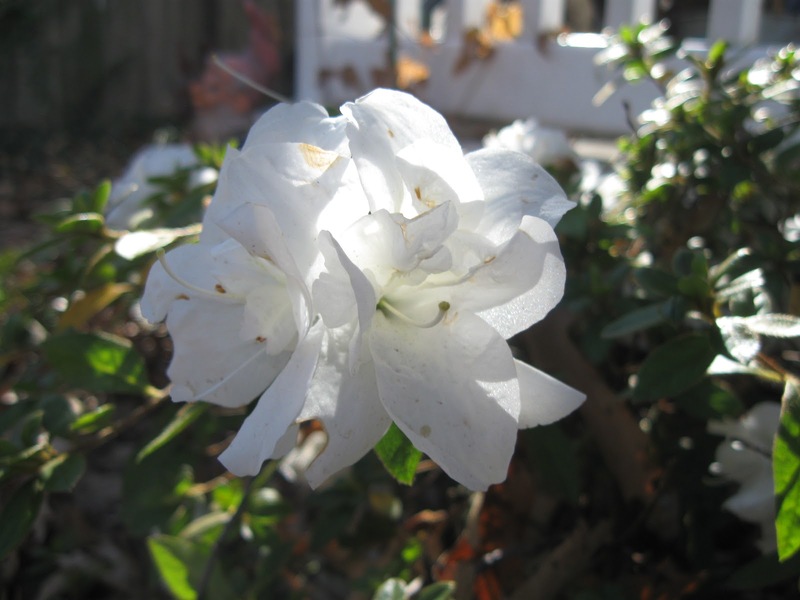 A hard frost will turn the blooms brown, so if you know a freeze is predicted, you can give them protection to prolong the bloom life by covering with a frost blanket. Both Longwood Gardens in Kennett Square, PA, and Brookside Gardens in Wheaton, MD, hold chrysanthemum shows each autumn. The displays include a variety of chrysanthemum colors and forms – from cascading baskets to topiary to single, large blossoms. Plan a visit to one or both to get an overview of the mums available to you. If you find yourself growing more interested in breeding and cultivating chrysanthemums, you may want to join a local mum enthusiast group. The Potomac Chrysanthemum Society (PCS). The club holds an annual plant sale each May in various locations around the beltway. All plants are $1.25 and selection is wide. The club also hosts monthly meetings at the Twinbrook Library in Rockville, MD, and other regular events such as a plant exchange. For more information, contact the PCS President Warren Pfeiffer at Potomac@mums.org. The Old Dominion Chrysanthemum Society is based in Alexandria, VA, meets monthly at the Falls Church Community Center in Falls Church, VA. For details, contact Jim Dunne at jim.dunne@mums.org. Kathy Jentz is editor/publisher of Washington Gardener magazine. 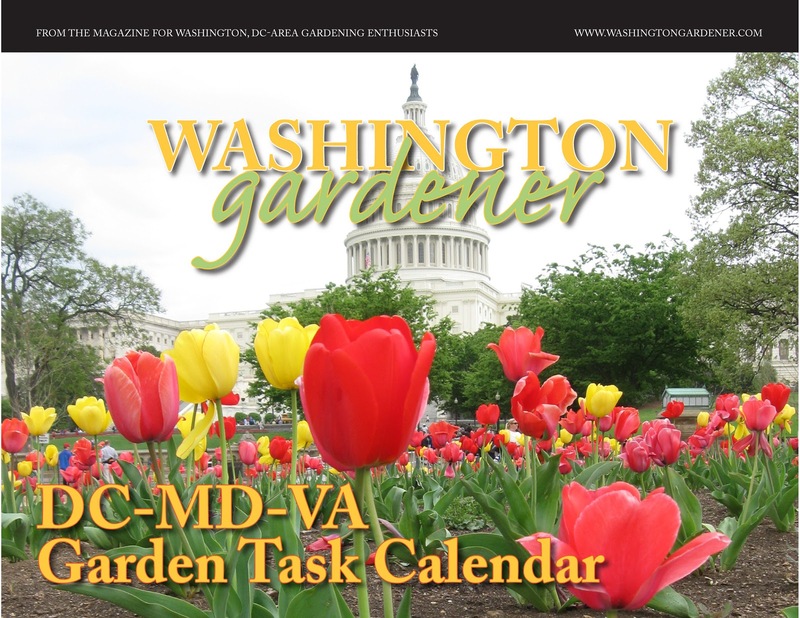 Washington Gardener magazine, is a new gardening publication published specifically for the local metro area — zones 6-7 — Washington DC and its suburbs. The magazine is published quarterly with a cover price of $4.99. A year’s subscription is $20.00 — that’s a savings of almost 40% off the per issue price. 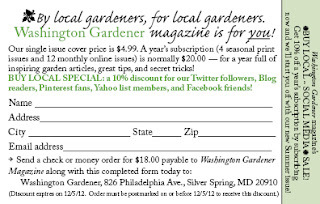 To subscribe to the magazine: Send a check/money order for $20.00 payable to “Washington Gardener” magazine to: Washington Gardener, 826 Philadelphia Ave., Silver Spring, MD 20910 OR to pay via Paypal/credit card click on the “subscribe” link at www.WashingtonGardener.com. 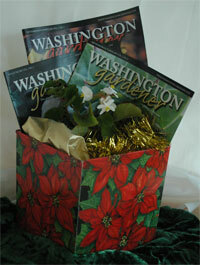 Washington Gardener magazine also makes a great gift for the gardeners and new home owners in your life. Hurricane Sandy came through the Mid-Atlantic earlier this week and we got off fairly lucky. For me, it was a few large tree limbs down, some roof leaks, and a bunch of shredded tropical plants to clean up. 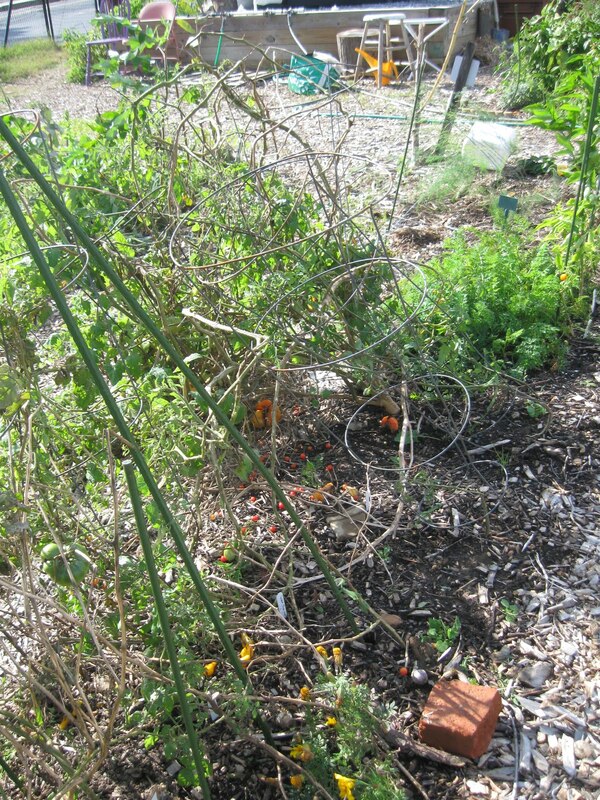 At my Fenton Community Garden plot, anything that was standing is down (tomato cages, trellis, plot markers). Anything covered by insulating fabric was exposed and needed to be re-pinned. I'm at the top of the sloping garden site so the mulch on the beds and pathways also went to the bottom of the garden, along with some nice top soil. It is about time to pull out the last of the summer crops in any case. I have a few lettuce plants coming in. I left in the carrots to see if they will sweeten up any after we get some frosts and I have a row of asparagus that will stay so it can mature for future harvests. The spinach and broccoli are in good shape as well. 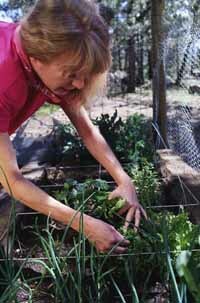 I plan to put in few rows of garlic also as soon as the hurricane-soaked soil dries out a bit. This will be my last weekly report from the Fenton garden in 2012. I plan to be back in the plot and regularly checking in next March. Designing Neighborhoods for People and Wildlife from ASLA on Vimeo. Yesterday, the American Society of Landscape Architects (ASLA) in Washington, DC, released an animation that promotes the values of landscaping with native plants to support local wildlife, and it is now live on ASLA's web site:http://www.asla.org/sustainablelandscapes/Vid_Wildlife.html an is posted above. The key advisors for the animation are Doug Tallamy, author of Bringing Nature Home, and Ann English, ASLA, the Rainscapes Coordinator at Montgomery County, Maryland Department of Environmental Protection. I always like to give something on Halloween in addition to candy. Sometimes it is cool pencils or stickers. Other years I give out small toys. This year I went through my boxes of extra seed packs and sorted out ones I thought kids would enjoy growing or that had a fun autumnal look -- from pumpkins to carrots to sunflowers to funky gourds. I got out my box of scrapbooking supplies and found a "Happy Halloween" stamp. I stamped some card-sized paper samples then stapled them to the top of the seed packs. I think they turned out pretty nicely. 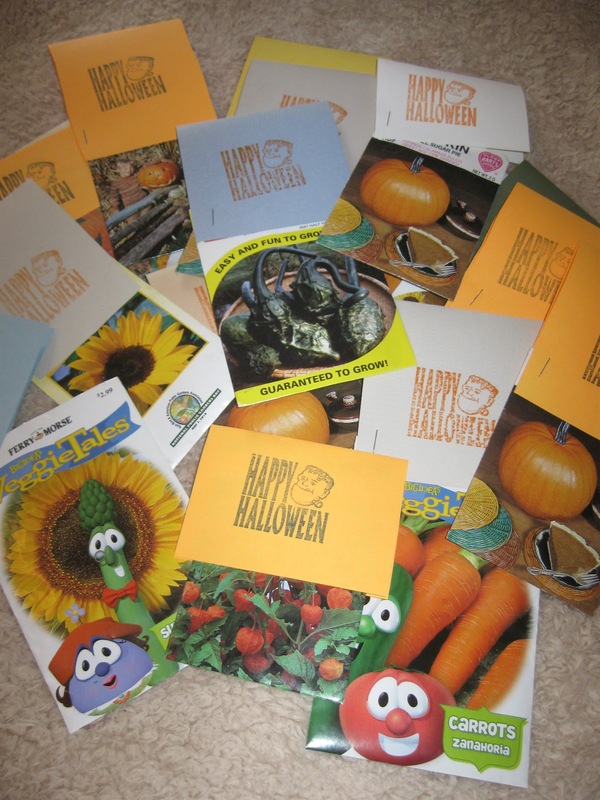 Next year, I'll try to remember to make these a few weeks in advance of the Halloween holiday to give out at any events Washington Gardener Magazine may exhibit at as a nice booth freebie for kids and adults. For our October 2012 Washington Gardener Reader Contest, we are giving away red t-shirts (size XL) and garden clippers from Corona Tools. An authentic American brand, Corona tools were born in the orange groves of California in the 1920s. Since then, generations of agriculturists, gardeners, landscapers, arborists, and construction professionals have turned to Corona to find high-quality tools that work as hard as they do. They know that Corona’s iconic red handles are an immediate symbol of quality and long-lasting durability. Learn more about CoronaTools at http://coronatoolsusa.com/. To enter to win a Corona T-shirt and garden clippers, send an email with “Coronoa” in the subject line to WashingtonGardener@rcn.com by 5:00pm on Tuesday, October 30 Sunday, November 4. In the body of the email please include your full name, email, mailing address, and tell us: “Your Favorite Gardening Tool and Why.” The winners will be announced and notified by November 6. Some of the entry responses may be used in future Washington Gardener online or print articles. 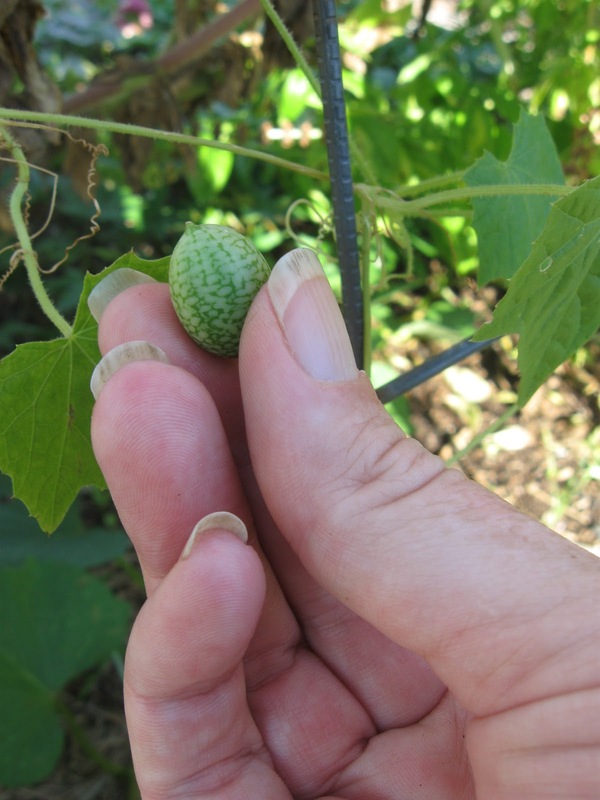 Spent some time in my garden plot at the Fenton Street Community Garden weeding and cleaning up some of the spent cucumber and melon vines. 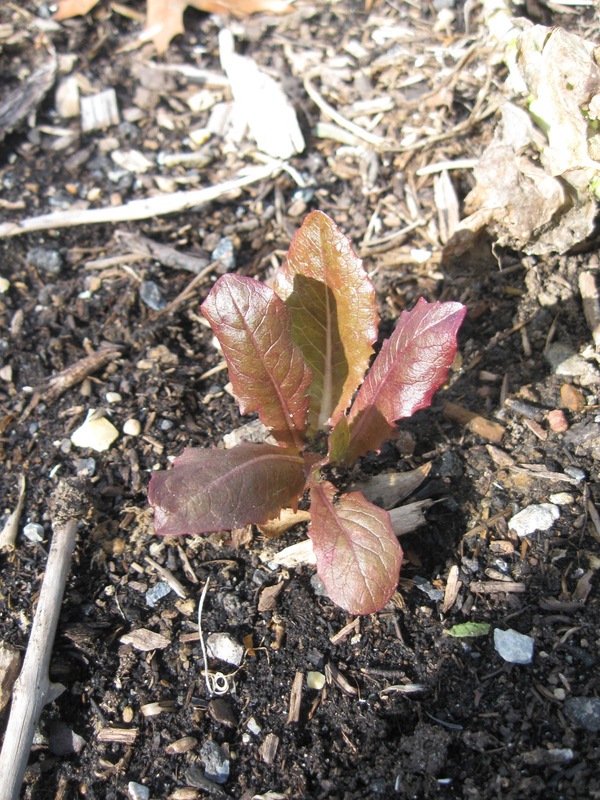 I did note that my Spinach is growing tall with nice foliage, but no heads forming yet. 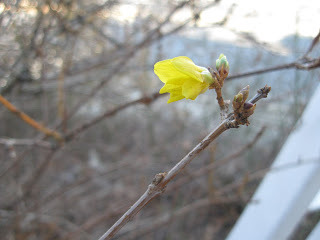 My pumpkin vine decided finally to set a flower (pictured) but unless we have the mildest winter weather, it is a waste of the plant's effort. Yeah, this has been a crazy year as far as timing. 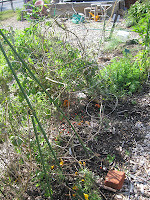 I also weeded a bit as with other things ending, it is very obvious where weeds like Mares Tail and other nasty plants have snuck in underneath and behind the "good" plants. And they have the nerve to be starting to set seed! 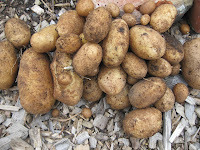 I dug my last German Butterball row of potatoes up too. 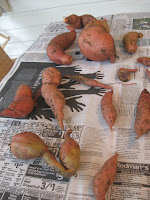 Leaving these in all season paid off as I have far more yield from these than the plants I dug up mid-summer. For 3+ days, I've bee trying to get my photos and video of the White House kitchen garden to upload so I can edit and share them with you all. I think I'll give that a break for now and hope that happens over the weekend so I can share them next week. Meanwhile, I'm postng this video from the Washington Gardener Magazine/MonkeySee.com vaults on "How to Winterize Your Vegetable Garden." 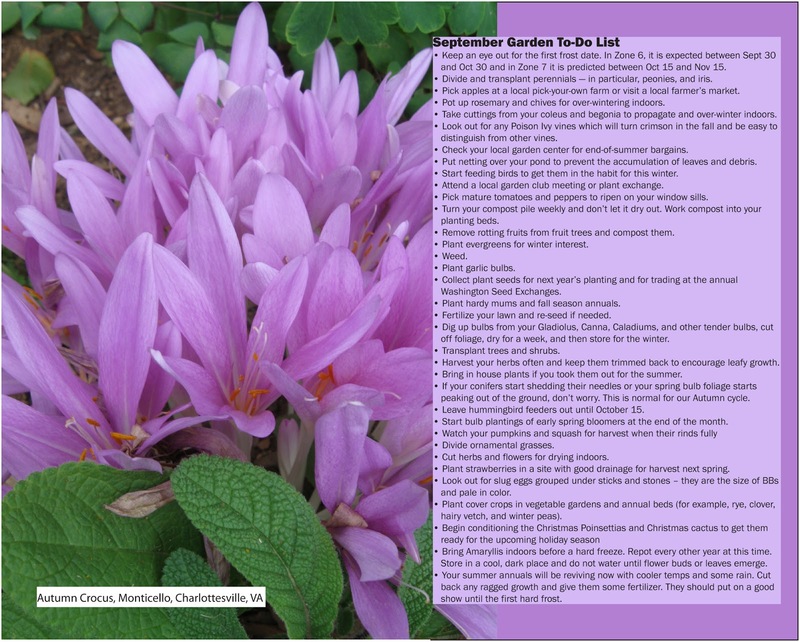 The Washington Gardener Enews ~ October 2012 is now out and being emailed as a PDF to all current Washington Gardener Magazine subscribers. I was away this past week at the Garden Writers Association annual symposium in Tucson, AZ. I had a great time networking, taking classes, and touring desert gardens, but I have to say I am so glad to be home where things grow lushly and almost effortlessly. I have about 500 photos from the trip I'm sharing shortly over at the http://www.facebook.com/WashingtonGardenerMagazine page -- from variegated figs (the fruit not the foliage) to the true blue cactus -- I think you'll enjoy the photo album. 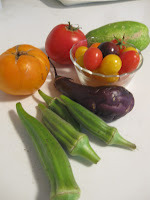 Between unpacking and catching up on piles of mails, emails, phone messages, etc., I ran over to my community garden plot to see how things were growing. This green eating machine (pictured above) was on a broccoli plant that somehow was outside the Remay cloth cover I had placed over the row in order to protect them from critters such as this one. I suppose while I was gone the wind and rains may have exposed it and it did not take long for the greedy insects to descend upon it. Glad I was there today to pick him and a smaller brother off and to re-cover the plant. Maybe I'll actually be able to have some home-grown broccoli to enjoy this fall! What do you think of Espoma's new campaign launch to overthrow the "Big Brother" of lawn care with its organic alternatives? This plays off the classic Apple Macintosh commercial, which itself was inspired by George Orwell's novel 1984. 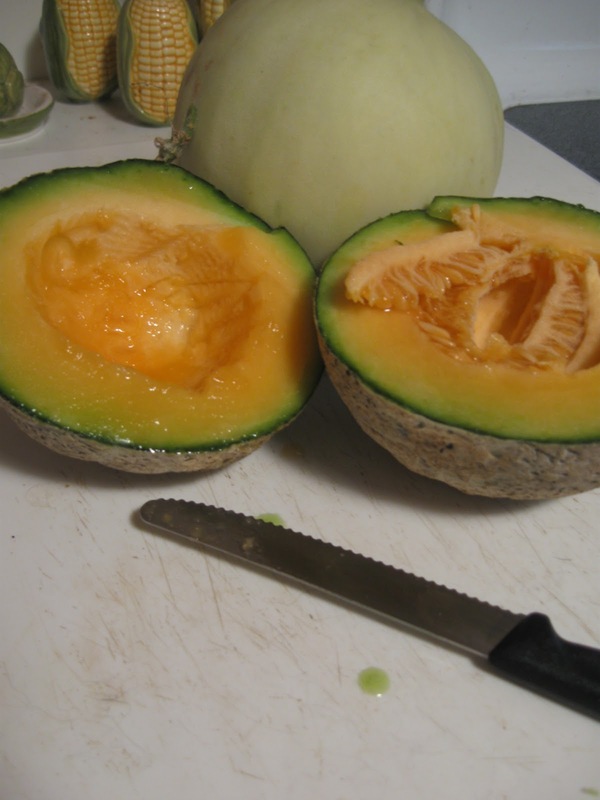 After waiting all summer, NOW my honeydew melon and cantaloupe become ripe. 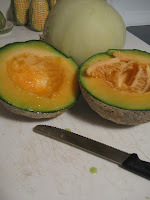 Here is my 'Hearts of Gold' cantaloupe cut open with honeydew behind it. Several more are still forming on the vines, though I doubt I'll be the frost to be able to eat those. This one was quite tasty. My little cat, Versace, also enjoyed a few small pieces of it. You'll have to take my word on that though as every time I tried to get a good shot of him and the cantaloupe together, he would run away. He is a stinker like that. Enjoy this weekend! 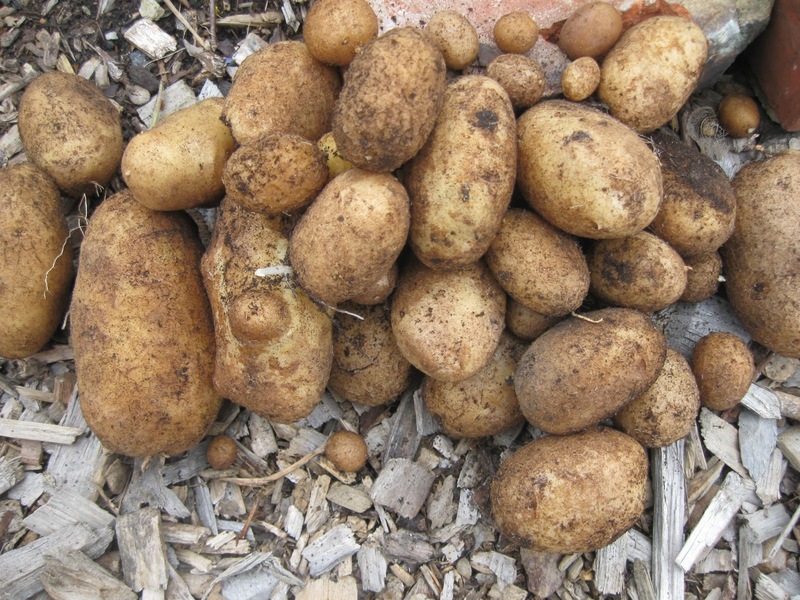 What is ripening in your garden plot? 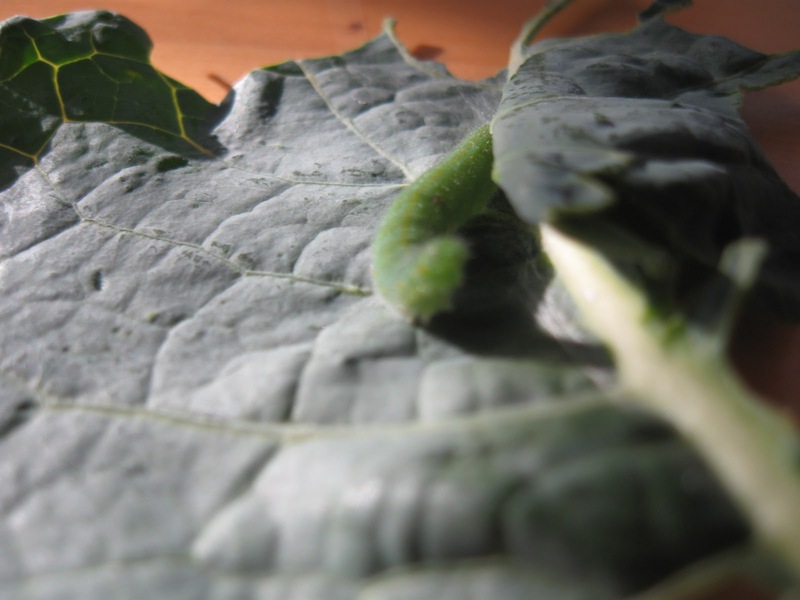 Local Master Gardener Kent Phillips talks about planting in the fall and overwintering plants through the cold months of the year. Many people think that gardening season is over when summer ends, but you can continue planting in autumn and produce delicious vegetables. This video is brought to you by the Home and Garden Information Center, part of University of Maryland Extension. provides resources and encourages people to start their own food gardens. 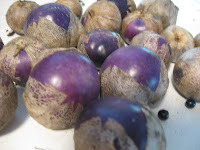 I grew one Purple Tomatillo plant at my community garden plot and it waited until now to all ripen at the same time. Which is great, if I had any plans for them, but, in truth, I just grew them because they are pretty and the seedling plant was free to me. So any suggestions or recipes? This week, I thought I'd share this inspiring video about a local master gardener. 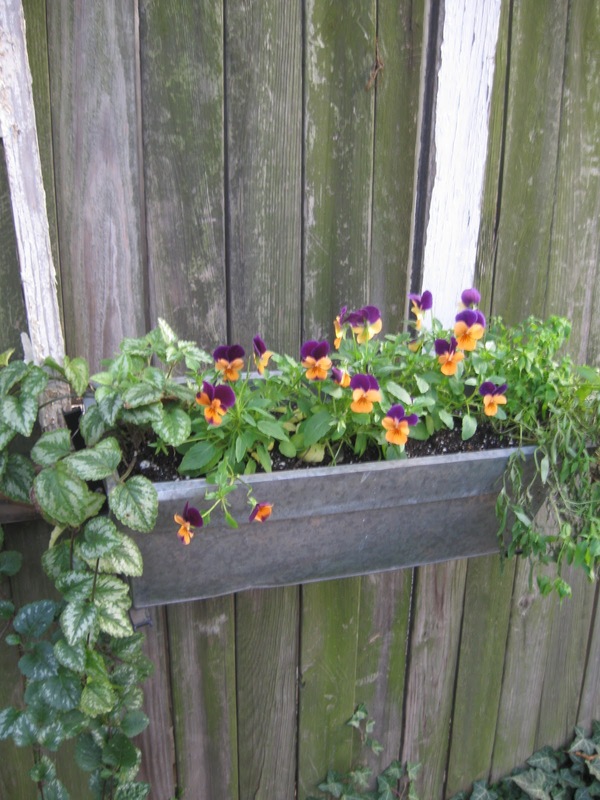 "Master Gardener Larry Kloze shares his experiences with urban gardening and community gardening as a part of the University of Maryland Extension program in Baltimore, Maryland"
Our Summer 2012 Washington Gardener Magazine issue is now out. 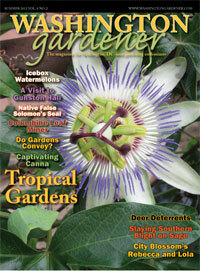 The cover story is on Tropical Gardens — from hardy exotic plants to native look-a-likes. You can create a cool paradise in your own yard. 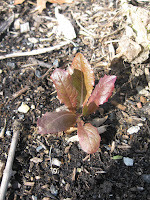 or go to www.washingtongardener.com/index_files/subscribe.htm and use our PayPal credit card link.